VINIFICAZIONE: Fermentazione alcolica in un grande serbatoio di inox a temperatura controllata. Segue la fermentazione malo-lattica e la maturazione in grandi botti di rovere da 44 hl per 5 mesi. VALUTAZIONE DELL' ENOLOGO: Il colore è rosso rubino acceso, il bouquet ricorda il profumo di mandorle e di violette. Il sapore è morbido, armonico e con acidità ben strutturata. 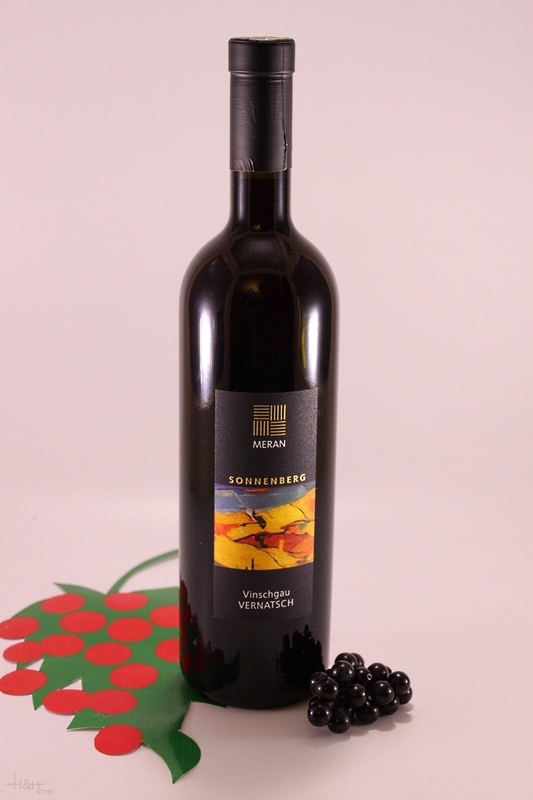 "Vinum Wine Magazine" has rated the wine "Kellerei Meran Burggrafler Sonnenberg Vinschgau Vernatsch Val Venosta, Trentino-Alto Adige, Italy" from the vintage 2009 on 01.10.2010 with 14 of 20 points. Bright ruby red colour, nose of blackberries and vanilla, savory tannis, smooth long finish. Gewürztraminer - 2017 - Winery S. Michele Appiano South Tyrol 14,45 EUR / 19,27 €/lt. Sauvignon Quarz - 2017 - Winery Terlano 40,65 EUR / 54,20 €/lt. Vernatsch Rotfüssler - 2017 - vine cellar Colterenzio 10,50 EUR / 14,00 €/lt. Pinot Blanc South Tyrol - 2017 - Winery Caldaro 11,45 EUR / 15,27 €/lt. Pinot Blanc Vorberg - 2016 - Winery Terlano 29,15 EUR / 38,87 €/lt. Lagrein Riserva Porphyr - 2016 - Winery Terlano 42,70 EUR / 56,93 €/lt. Riesling Castel Ringberg - 2017 - Elena Walch 26,55 EUR / 35,40 €/lt. Terlaner Classic - 2017 - Winery Terlano 18,15 EUR / 24,20 €/lt. Terlaner Pinot Blanc - 2017 - Wine Cellar Muri-Gries South Tyrol 11,85 EUR / 15,80 €/lt. Merlot Collection Graf Huyn - 2016 - winery Bolzano 16,30 EUR / 21,73 €/lt. Müller Thurgau Aristos - 2016 - Cantina Valle Isarco 18,10 EUR / 24,13 €/lt. Pinot Noir Riserva - 2014 - Cantina Bolzano South Tyrol 28,45 EUR / 37,93 €/lt. Pinot Noir Fuchsleiten - 2017 - Winery Pfitscher 21,45 EUR / 28,60 €/lt.